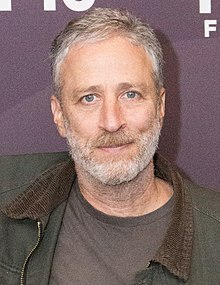 New York Ceety, New York, U.S.
Jon Stewart (born Jonathan Stuart Leibowitz, November 28, 1962) is an American comedian, writer, producer, director, actor, media creetic, an umwhile televeesion host. He wis the host o The Daily Show, a satirical news programme on Comedy Central, frae 1999 till 2015. ↑ "Jon Stewart Comedic Genres". Salon. November 24, 2015. Retrieved January 17, 2015. This page wis last eeditit on 13 Mairch 2018, at 03:32.